Saginaw Bay walleye fishing continues to be very good. When boats can get out, limit catches were reported. There are further indications that the walleye are making the annual summer movement toward deeper water but good numbers of fish are still being caught around the inner bay. Good fishing was reported just north of the Green Spark Plug in 20 to 25 feet, west of the Red Spark Plug in 19 feet, off Pinconning in 17 feet, the Bay City State Park and mouth of the Kawkawlin River in 10 to 12 feet, Callahan Reef in 10 feet but the weeds are starting to become a problem, in the Slot between Quanicassee and North Island in 12 to 16 feet, the Bar off Fish Point in 12 feet and the west side of the Bar in 17 feet and north of Big Charity Island in 25 to 32 feet. Crawler harnesses continue to produce, but hot-n-tots are also working. Gold, purple, anti-freeze, and green were good colors. Saginaw River walleye have been caught in the lower river between the mouth and the Coast Guard Station. Most are trolling crank baits. Au Gres Area reports excellent walleye fishing continues in 25 to 30 feet. Most boats are now going south of Pointe Au Gres and fishing the outer reaches of the inner bay or out near the commercial shipping channel. Grindstone City had very good walleye fishing between Grindstone and Burnt Cabin Point. Anglers are using Hot-n-Tots or wiggle warts in 24 to 29 feet. Oscoda boat anglers caught lake trout, salmon and steelhead straight out and north of the port. Start shallow in the early morning and work your way out to waters up to 150 feet deep. Fish all depths and use dark colors. Pier anglers are drifting crawlers and leeches with a slip bobber and bottom bouncers for walleye. Those fishing off the end of the pier caught a few fish on small spoons and body baits. 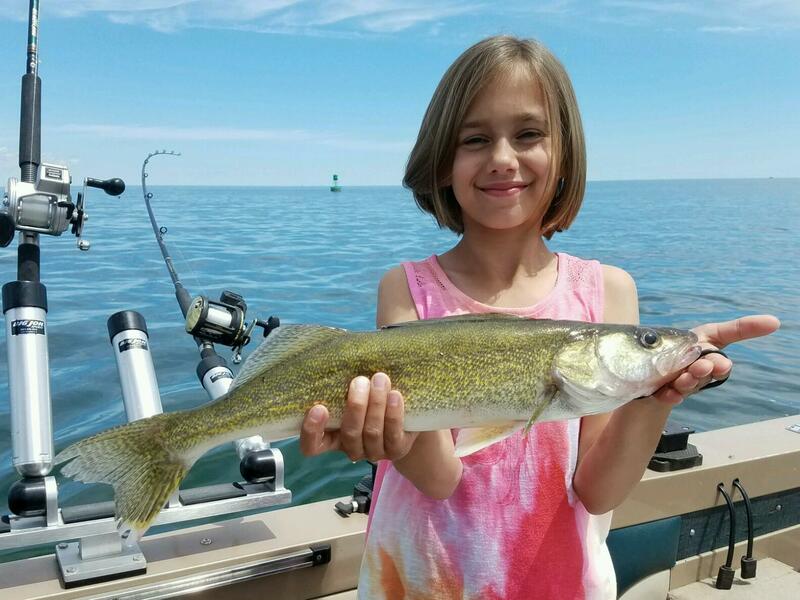 Port Austin walleye fishing was good to very good along the reefs to the west and in 20 to 35 feet off the Port Austin Light. Crawler harnesses with pink, anti-freeze, perch or copper blades worked best. Tawas Area most walleye anglers were heading south and fishing just north of Big Charity Island but some were even fishing off Oak Point and north to Caseville. A change in water temperatures as a result of the windy conditions was causing the fish to relocate. A couple boats trolling in 35 to 55 feet south of Buoy #2 have done well for lake trout and steelhead. Pier anglers are catching a summer mix of smallmouth bass, rock bass, freshwater drum and the occasional walleye in the evening. Tawas River fishing was slow. Sometimes we want to go fishing and enjoy getting out on the water, but just don’t want to expend a lot of energy – especially if it’s too hot to work hard at it. Here’s a laidback way to cover water and find fish you might otherwise miss, without needing complicated gear or a fancy boat. All you need is basic fishing tackle and some kind of watercraft. Even a rented rowboat, paddle boat or canoe can work. Rig your rod with light line (four to eight pound test), tie a small hook on the end of the line (#4 or smaller), and add a split shot or two about a foot above the hook. Favorite baits for this method include half a nightcrawler or a baby crawler, leeches, or even some of the heavily scented artificial leeches or small plastic worms. Hook the bait in the center of one end so it doesn’t spin when you gently pull it through the water. Position your boat so the prevailing breeze will carry it along a drop-off or across any area with water depths of at least 12 to 20 feet. Let out enough line, or adjust the amount of weight on the line, so your bait will stay about 12 to 20 foot deep no matter how deep the water actually is. 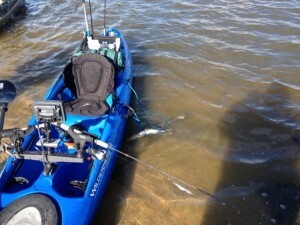 Then set your rod down against the side of the boat, relax and watch the tip of the rod for a bite. Drop the rod tip when you see a bite and count to three before reeling in and setting the hook with a firm pull. Not too hard! 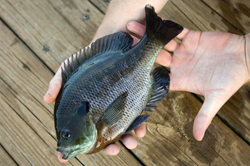 Many fish such as bass, walleye, yellow perch, crappie and larger bluegill will move into deeper water and suspend at their preferred cooler temperature during the hot summer months. Slowly drifting a larger, natural bait at these deeper depths will often get you more than you bargained for.